How cute are these?! Cute chocolate and vanilla flowers...or something like that-only rather than smelling them, I'd much prefer eating them. Anyway, I've been on a mission to find the quintessential most fudgiest, most chocolaty, most sinful, most sink-your-teeth-into-heaven kind of chocolate cake. And folks, I think I just found one and it has been staring me in the face for years. Right there on the back of the Hershey's cocoa can. 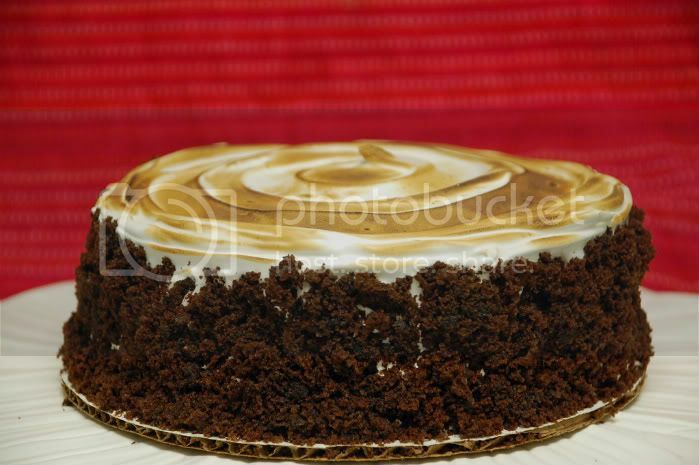 This cake is just that; fudgy, chocolaty, rich, dark, and sweet. This recipe satisfied 6 regular sized cupcakes and one rather large 8X8 cake which I then cut in half (cross-sectioned) and then created 2 layers from each half resulting in a wondrous very high 4 layer cake. 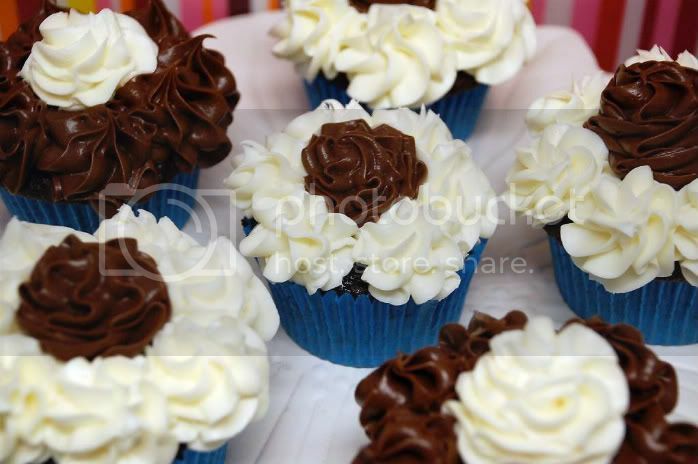 I frosted the cupcakes with chocolate and vanilla buttercream using large open and closed flower tips. 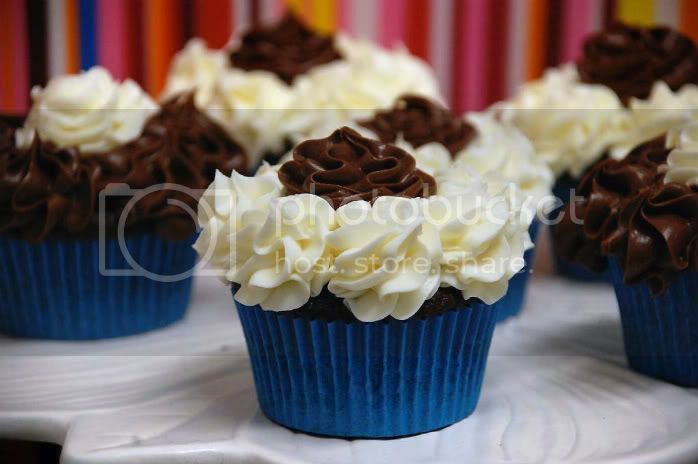 The cupcakes and frosting were a cinch to whip up and I highly recommend you do so! The cake baked very dark and rich and the buttercream was a great compliment. Oh, and did I mention that I filled these bad boys? Yep. Nutella. 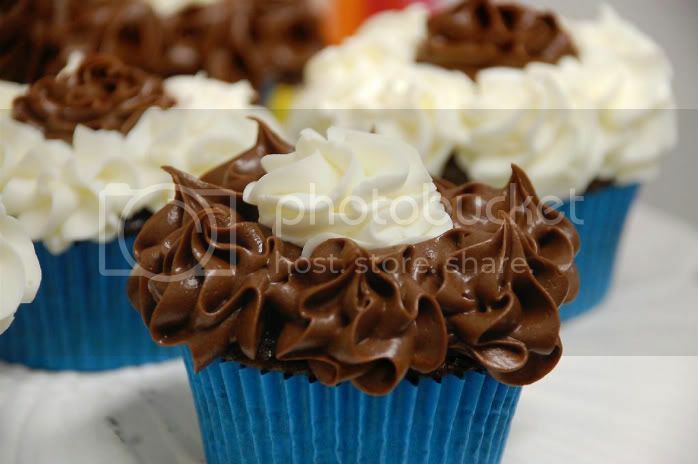 I filled each cupcake with Nutella to the brim for an extra blast of chocolate-ness. One more thing, this is a one-bowl recipe. I repeat, one bowl recipe! If that doesn't have you rushing into the kitchen as we speak then I don't know what would! Ready. Set. Go. Whitney of What's Left On The Table is to thank for this weeks TWD recipe. 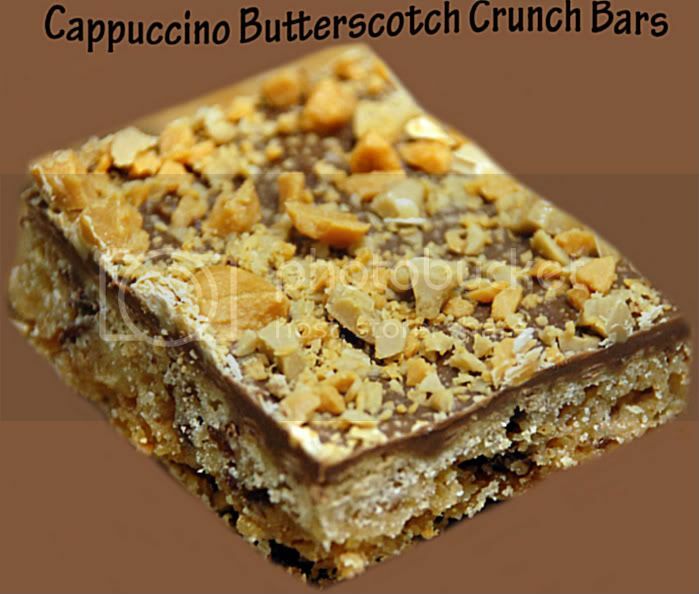 Although the original recipe called for chopped Heath Bar bits on top thus resulting in a Caramel Crunch Bar; I went with chopped cappuccino and butterscotch chips on top. That explains the renaming of this recipe above. A buttery shortbread kind of a crust smothered in milk chocolate and topped with cappuccino and butterscotch chips. Yum. This recipe was sinfully easy and even more sinful to shovel down my gullet. 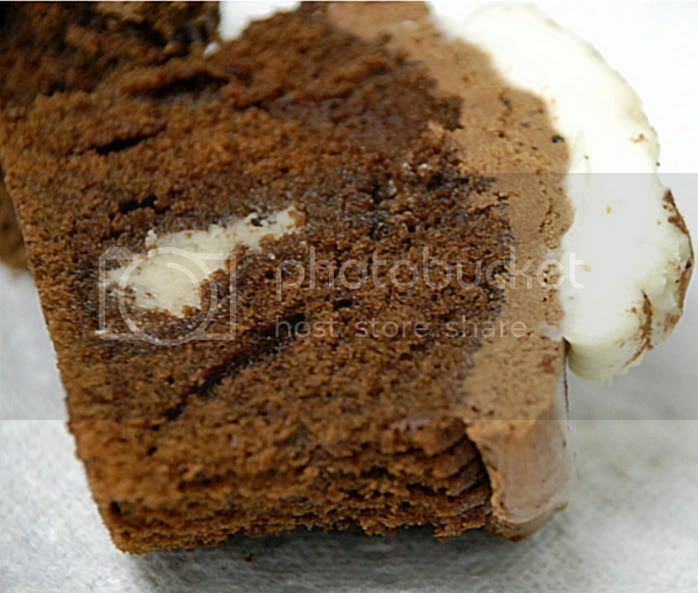 The crust has bits of finely chopped chocolate, of your choice, throughout, which created a super chocolaty treat. I went with milk chocolate as opposed to bittersweet chocolate because, lets face it, I prefer a less sophisticated chocolate in a bar such as these. I want to get the closest to an original Hershey's bar as I can! I put these in the freezer and slowly but surely they are vanishing before my own eyes. Eeek. You can find the recipe here! Be creative and switch up the toppings. Butterfinger, anyone? In addition to the cupcakes below I made a birthday cookie cake for the boys. I used this very basic cookie dough recipe, flattened it on a round pizza pan, baked it, cooled it, and lastly, decorated it. This was SO GOOD. 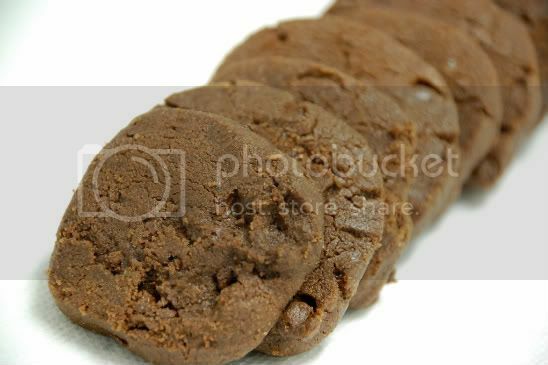 The cookie was super soft and chewy with chunks of milk chocolate chips. This was probably the biggest hit of the night and it was so easy to make. I used canned chocolate and vanilla frosting (the nerve!) for the border piping and decorations. I'm trying to work on my handwriting so I used a plain round tip for the happy birthday slogan. How'd I do? If you need something quick, fun to make, and very tasty then go with this cookie cake. You can change it up and add peanut butter, nuts, raisins, oats, etc. I will definitely be making this again in the near future! 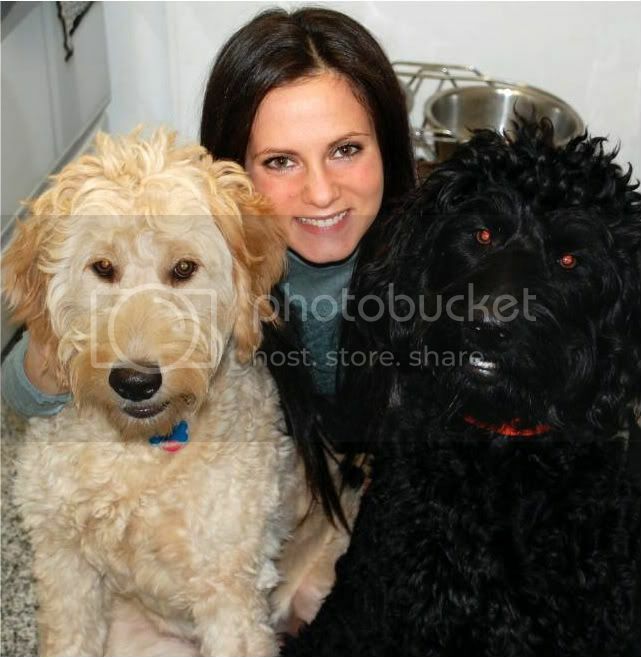 My dogs are 1!! 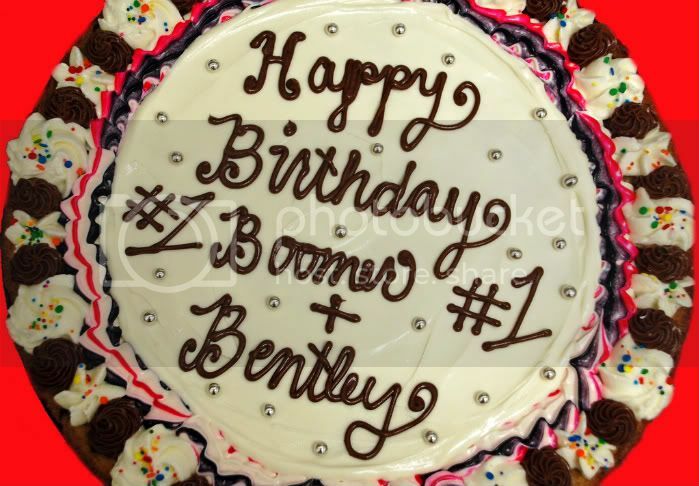 Happy Birthday to Boomer & Bentley!! Since I don't have any children yet (I'm still young!) my dogs are my children for the time being. 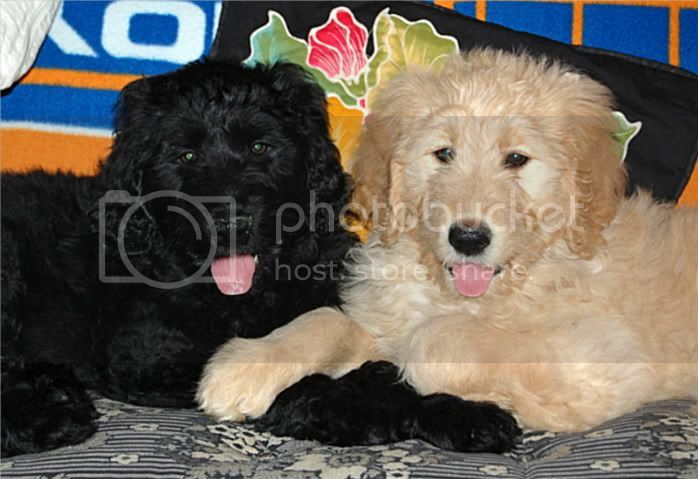 I got Boomer and Bentley last April when they were 8 weeks old and 10lbs each. My have they grown into beautiful big boys weighing in at 70lbs a piece! Wednesday was their 1st birthday and in honor of them, I'm throwing them a birthday bash tonight filled with cupcakes...and cake...and crunch bars...and cookie cakes...and--yea, you get the point. Grown up Boomer & Bentley at 1 year! And yes, I realize that they are bigger than me. And I swear, I'm totally sane. These banana cupcakes are one of several desserts that I made for the party. 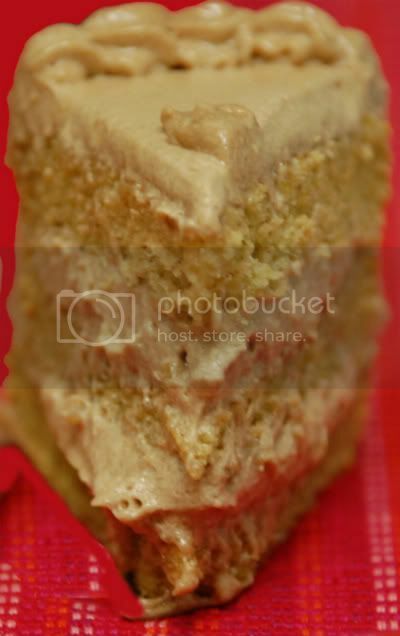 I used this basic banana cake recipe and added mini chocolate chips. 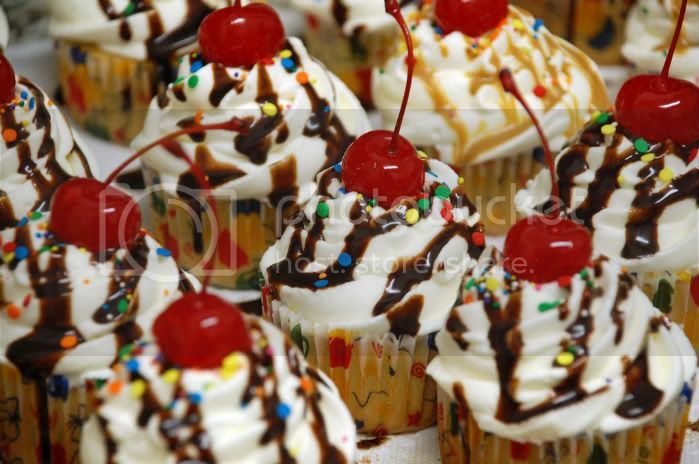 I topped with whipped cream, Hershey's chocolate sauce, sprinkles, and a maraschino cherry! For the whipped cream I literally just dumped whatever I had left in the carton, whipped it up, and added an extremely large amount of powdered sugar until it was very sweet! I put the cream in the fridge for about 20 minutes before decorating and it piped beautifully. The cold whipped cream also enabled the chocolate sauce to hold its drizzle. These tasted exactly like a banana split and were really easy to make. Enjoy!! should never be forgotten! Please do yourself a favor and check out the recipe at Stephanie's blog here! Voting Begins on Sunday March 1st @ 8pm thru Friday March 6Th at 12noon at No One Puts Cupcake In A Corner. Click here to vote for me on March 1st! 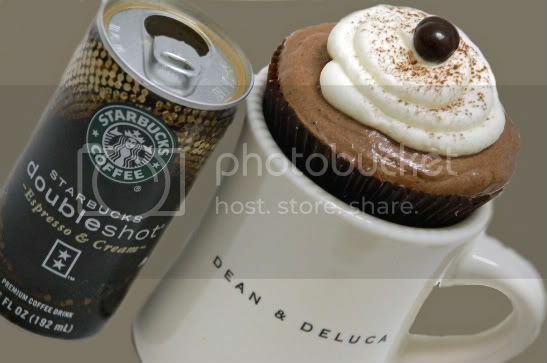 The ultimate caffeine cupcake. Espresso, mocha, and cawfee (for all my fellow NY'ers) oughta give you a lift on those dreadful early mornings when it's still dark out. You know the ones. I experience them daily. 530AM visits to the gym. Not a pretty sight. This month's Iron Cupcake secret ingredient is, as you can see, coffee. I love the flavor of coffee in baked goods and especially ice cream! Coffee has such a powerful rich flavor and paired with the right ingredients can create a delightful treat. Daniel Boulud is a famous French chef with restaurants all over the country, most notably NYC--lucky for me, I live here! One of my most favorite restaurants belongs to him, Cafe Boulud, which is this fantastic French cuisine restaurant with the most mouth-watering unique dishes. 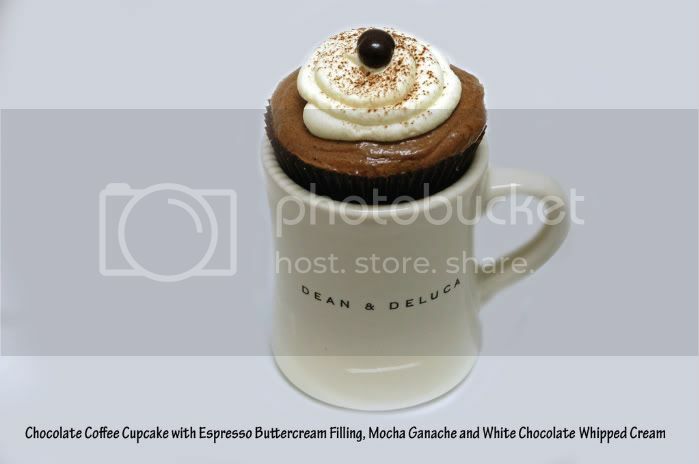 While searching around for the quintessential coffee flavored cupcake, I stumbled upon Daniel Boulud's chocolate coffee cupcake recipe. How can a girl resist? I was sold. This cupcake has a chocolate coffee base to the actual cake. It is filled with an espresso buttercream which I created myself for an extra umph and then topped with a mocha ganache and white chocolate whipped cream (which was to die for). I sprinkled cocoa powder on top and added a chocolate covered espresso bean for garnish. Holy DELICIOUS! 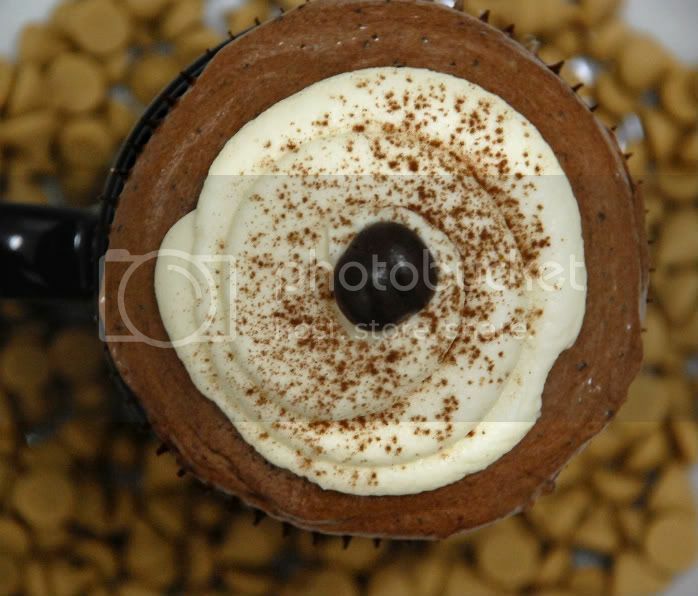 These cupcakes were a real hit and boy was I glad that I entrusted my Iron Cupcake entry with Mr. Boulud himself. I served these in coffee mugs on tea plates adorned with cappuccino chips. If you're looking for a coffee kick, go with these! Also, CAKESPY, who is now going to be doing a piece for our winner each month until further notice! 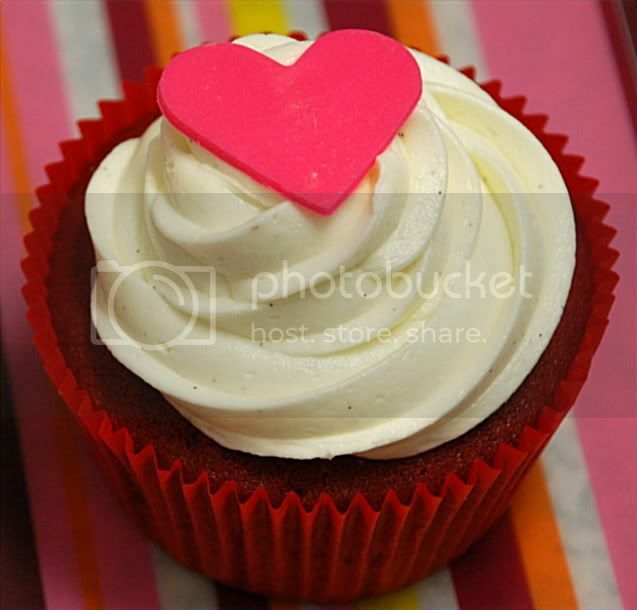 SWEET CUPPIN CAKES BAKERY AND CUPCAKERY SUPPLY will be adding some prizes for February. Combine 1 cup of the heavy cream and coffee beans in a small saucepan and bring to a boil over high heat. Remove from the heat, cover, and let infuse for 10 minutes. Strain through a fine-mesh sieve into a clean sauce-pan and bring back to a boil. Put the chocolate in a medium bowl and pour the hot cream over it, stirring slowly, until the ganache is smooth. *If you want a fluffier ganache which makes for easier and more attractive application, wait for the ganache to cool to room temperature then put in the bowl of an electric mixer. 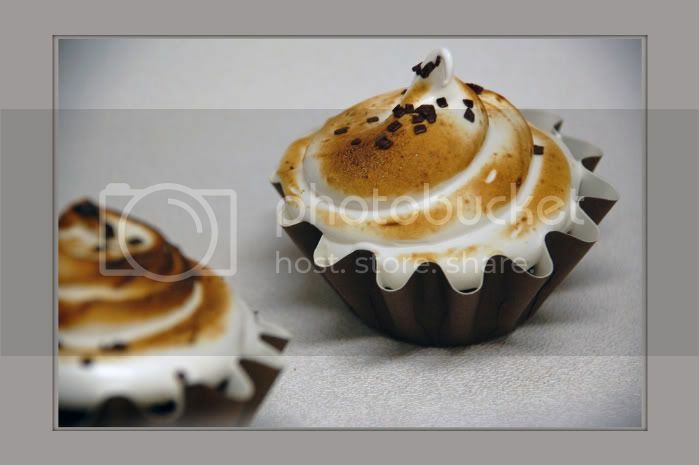 Whip on high speed until desired consistency* Spoon enough ganache over each cupcake to fill the liners to the rim. Next up: Southern Coconut Cake. This month's Cake Slice Baker's entry was this Southern Coconut Cake from the book Sky High Irresistible Triple Layer Cakes. 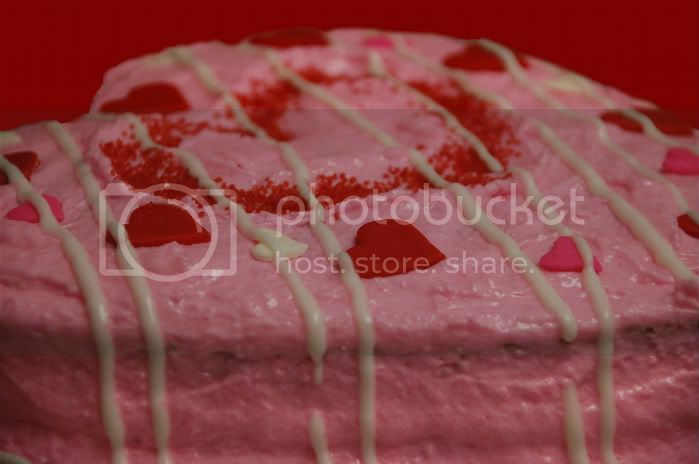 This cake is clearly Valentine's Day appropriate based on the colors and decorations I used. As far as the actual cake went, it was really delicious. 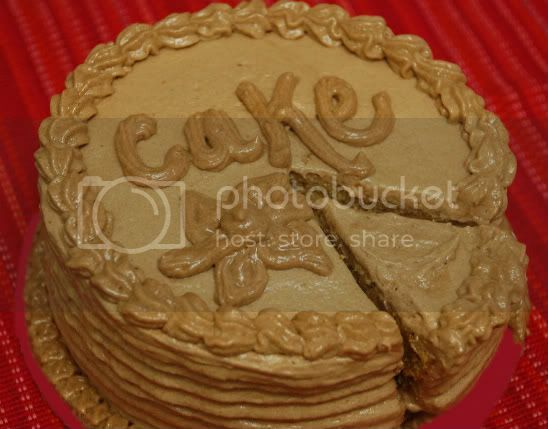 The cake was very light and not overly sweet while the icing was fantastic. I got many compliments today at work with every one of them relating back to the "lightness" of the cake. I once again quartered the recipe and baked it in an 8inch heart pan. I tinted the frosting pink and used red fondant to cut out the mini hearts. In the center of the cake, using my angled spatula, I etched a heart and then filled with red sugar crystals. 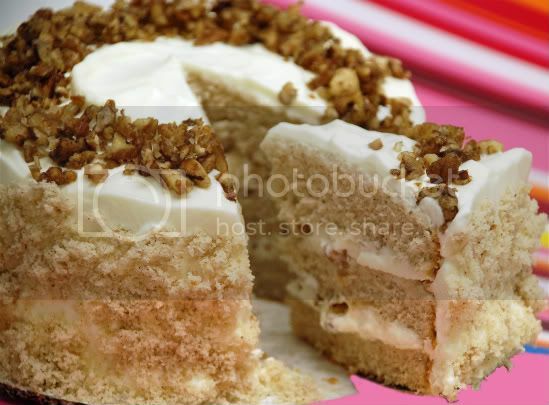 Check out all the other amazing cake slice bakers and their versions of this southern coconut cake! 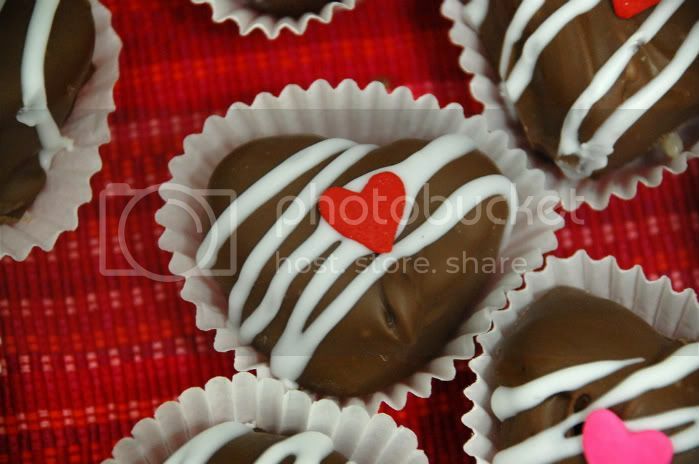 Truffles come to mind when I think about Valentine's Day. I think about all the pretty boxes of chocolates out there from Godiva, Hallmark, Russel Stover, et al. I enjoy eating them even more! 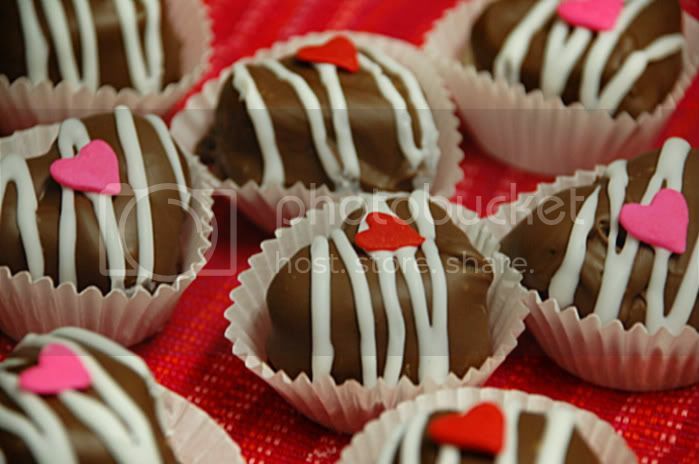 Anyyyyyyyyyyyyway, day 2 of V-Day treats were these cake ball truffles. While shaving off the tops of the layers from this cake, I saved it, crumbled them up and then mixed in this cream cheese frosting. 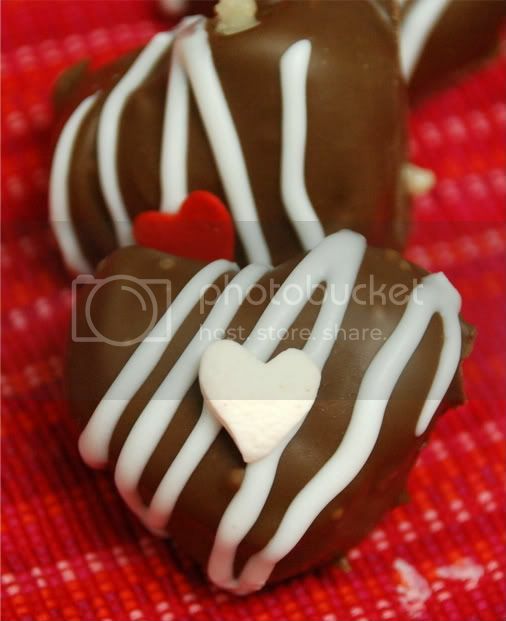 I used small heart cookie cutters to make the heart shapes, froze them for a bit, dipped them in milk chocolate, drizzled white icing and placed a small little candy heart on top. I put all of these in a Valentine decorated tin with a bow and served them at work. They were a HUGE hit. These are such a great way to show your loved ones how sweet they are! Valentines Day was always a holiday that I never really cared for. I've felt this way whether I was single or not. I'm not a pink and hearts kind of girl and I was never a fan of holidays that put the focus on me, i.e my birthday, etc. I always got a bigger high out of giving, rather than receiving, therefore I'm displaying my distaste for this holiday by baking Valentine's Day treats all week for my office. Day #1 of VDT (Valentine's Day Treats) are these red velvet cupcakes with a vanilla bean buttercream and fondant heart garnish. 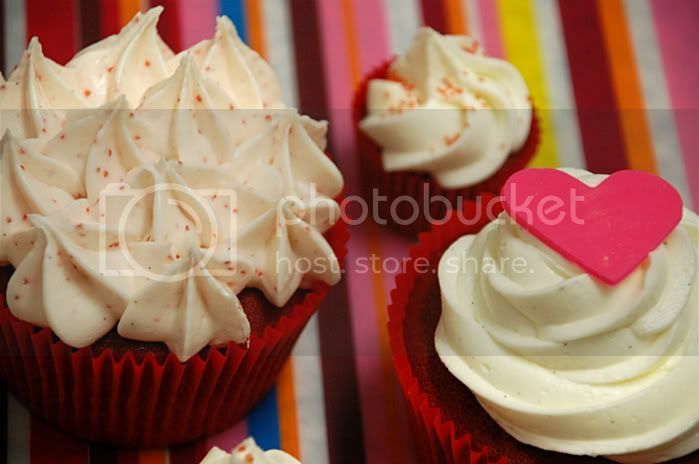 I don't know about you but what says Valentines Day better than red velvet...? Exactly. I took this recipe from the amazing Baked cookbook. 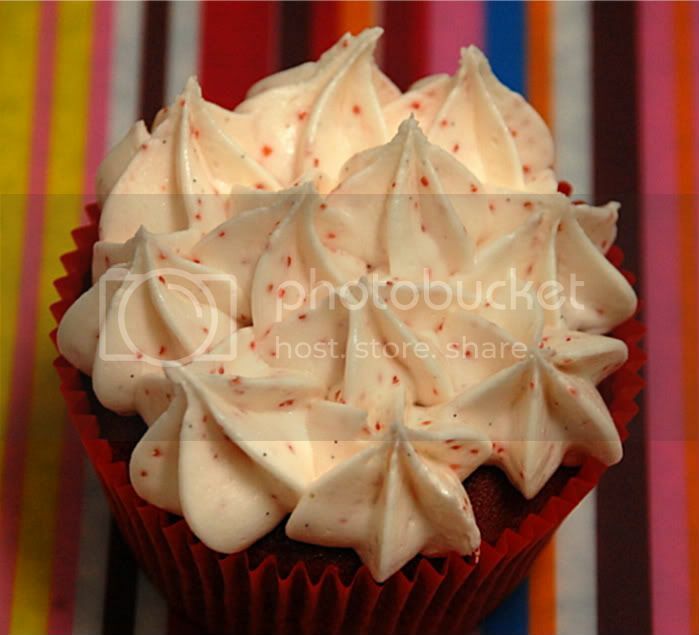 The preparation for this red velvet was unlike any other I've ever made. The cocoa powder and food coloring "bloomed" in boiling hot water for about 10 mins and the baking soda was mixed with cider vinegar and added in last. The end result? Delicious. In a medium bowl, whisk together the cocoa powder, food coloring, and boiling water. Set aside to cool. In the bowl of an electric mixer fitted with the paddle attachment, cream the butter and shortening until smooth. Scrape down the bowl and add the sugar. Beat until the mixture is light and fluffy, about 5 minutes. Add the eggs, one at a time, beating well after each addition. Sift the flour and salt together into another medium bowl. 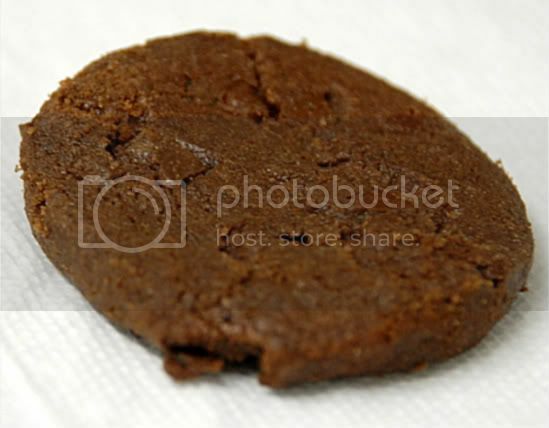 With the mixer on low, add the flour mixture, alternating with the cocoa mixture, to the egg mixture in three separate additions, beginning and ending with the flour mixture. Beat until incorporated. Cream the butter in the bowl of an electric mixer until soft and creamy. Add the vanilla bean. Gradually add the sugar and beat well being sure to scrap down the sides of the bowl. Add the milk until desired consistency. Rad. Remember the word rad? It was big time back in the late 80's and it was surfer/west coast lingo for "cool" or, according to the dictionary is slang for wonderful. While the word rad is completely outdated it totally applies to this cake. This. Cake. Is. Rad. I'm in love with the color schemes! Didn't you hear..? Brown, pastel blue and purple are the new "it" colors. OK, I completely made that up but they really should be because they look so darn rad together. If you haven't already noticed, I'm quite into this cake...And the taste...oh, the taste. 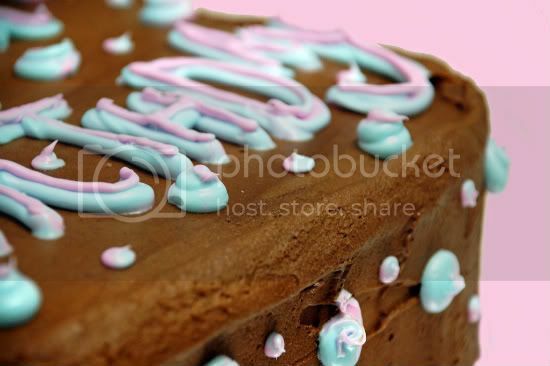 Fluffy white cake engorged in homemade chocolate buttercream frosting. What's better? 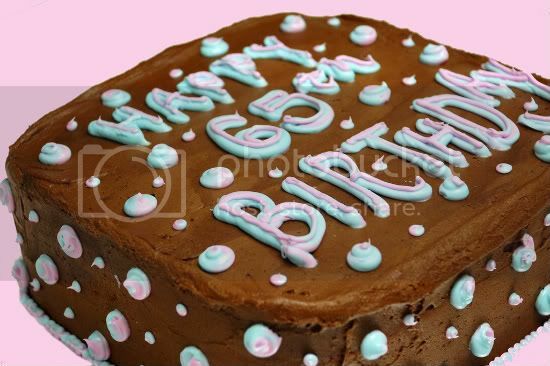 I made this cake for a 65Th birthday this past weekend. I tripled this recipe using a 10-inch square spring form pan to create 3 layers. This recipe set up just like boxed cake mix, only you actually make the "cake mix". I made a few extra "cake mixes" to keep on hand when I'm in a rush. They are really great to have in your kitchen. Just add the wet ingredients and you're done. 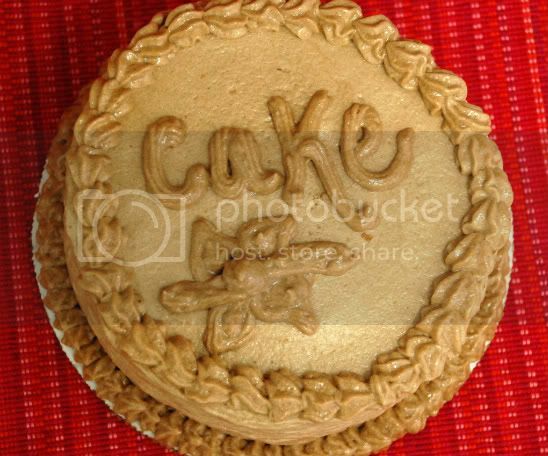 I used this vanilla buttercream recipe to decorate. This cake was fantastic! 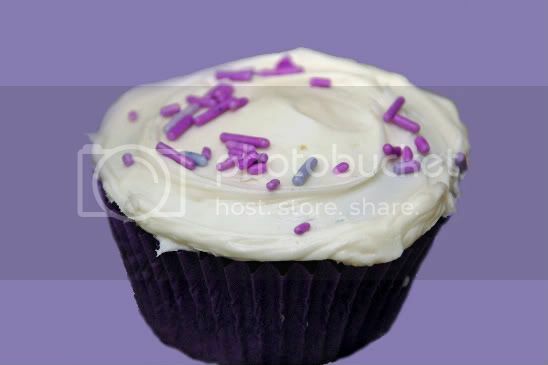 I even had some batter left over and made 1/2 dozen cutie cupcakes. Say it with me folks, rad. Lets just say that I've had the desire to make these cookies for over a year now. You can imagine my excitement when Jessica of Cook Book Habit chose them as this weeks TWD selection. Can we say yum.These cookies were soooooo awesome. Crunchy, chocolaty, and crispy with an overwhelming, yet delicious, taste of chocolate bound by mini chocolate chips. These cookies were a cinch to whip up and baked beautifully. I have the entire bag in my freezer for frequent snack breaks! The next time I make these-and yes, there will be a next time-I'm going to substitute the mini chocolate chips for toffee bits. Mmmm. Check out Jessica's blog for the recipe! The next cake I made from our fabulous group, The Cake Slice Bakers, was this sweet potato cake with an orange filling and chocolate cream cheese frosting. I saw sweet potato cakes popping up all over the web on my favorite blogs this year but never tasted it before. I love sweet potatoes, love cream cheese frosting, and love orange flavoring so how could I go wrong here? Well, I'm so glad I made this cake because it was absolutely delicious. While it tasted very similarly to a pumpkin cake, the sweet potato really mended well with the orange tang and spices which included nutmeg, cloves, and cinnamon. Now for the frosting...ahhh, this sweet scrumptious frosting really did the trick. I really whipped it up good so that it would have more of a light whipped cream consistency rather than a thick dense cream cheese texture. 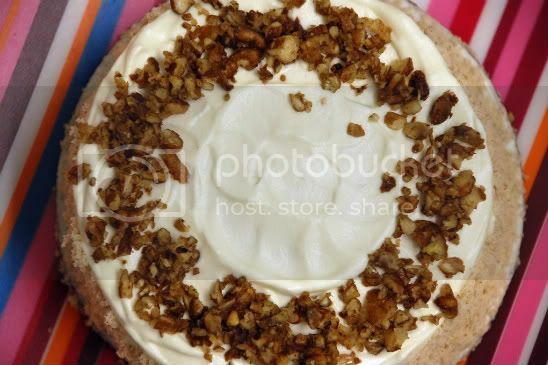 For whatever reason I piped "CAKE" with a wanna-be flower and garnished the borders with shells. This is a cake that I would absolutely make again. Enjoy. 3. When the sweet potatoes are cool peel off the skin and remove any dark spots. Cut the potatoes into chunks and puree in a food processors. Puree until smooth. Measure out one cup of potato puree and set aside. 3. Add the melted chocolate to the remaining icing in the bowl and beat until well combined. Well, a new year calls for the joining of new groups. As if I haven't dedicated enough of my time to my interactive baking groups, I decided to go ahead and join another; The Cake Slice Bakers. Of all the various baked goods out there, I definitely enjoy baking/creating cakes the most so I knew this group would be for me. Plus, it didn't hurt that I already purchased the book that we are baking from (Sky High Irresistible Triple Layer Cakes) months ago. Now I have a real opportunity to actually bake the cakes that lie within the pages of this monstrous book. I'm a few cakes behind so I did my best to catch up this weekend. Preheat the oven to 350F degrees. Butter three 9-inch round cake pans. Line the bottom of each pan with parchment paper or wax paper. Pu the white chocolate in a medium heat proof bowl. In a small sauce bring 1/2 cup of the cream to a boil. Pour the hot cream over the chocolate. Let stand for 1-minute, then whisk until smooth. Let the white chocolate cream stand until cooled to room temperature.